last night I read most of the comments by readers of the NYTimes about the Nobel committee’s selection of the efficient market idea proposed by Fama, measured by Hansen, and criticized by Shiller. the bulk of the comments focused on the idea that economics is not a science, and that the Nobel selection wrongly promotes the notion that markets “work” well, which ignores the pain and suffering of people caught up in transitions and bubbles. 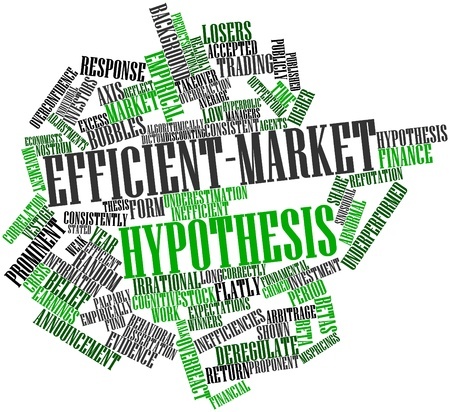 Recall Fama’s “efficient market” idea means that financial markets collect, aggregate, process, and reflect back all available information that exists today, both the laws of man and the laws of nature. Based on this idea, Fama argue that passive management of financial assets will be as effective as active management by brokers trying to pick winners. The key point is that the institution of the “market” is more powerful than the whims of people. Shiller’s criticism is based on the idea that people are not ECONOBOTS–but instead humanity can overwhelm the power of the market, and our tendency to herd together can create “irrational exuberance”, which leads to too much speculation which can create valuation bubbles that pop, leading to pain and suffering. Fama does not believe in bubbles–rather he argues that this blips in asset prices are just the market doing its job of reflecting back what people believe, even if it is wrong in the short run. The readers were offended that this idea of rational and efficient ECONOBOTS deserves a Nobel. But their criticism toward economics and markets is not new and is in fact what economics is all about–the blending of science and art to understand better the power and limits of using a decentralized scheme to organize the free will of some 7 billion conflicting human needs. remember what ECONOMICS actually is about–the study of VALUE created by EXCHANGE (trade and coordination). the term “value” makes economics an art because values are subjective–what you “value” I might loathe, and visa versa. But we have markets that allow us to trade what you want for what i want. we both gain value. the science is to understand how markets actually work to create value (or not). I have spent most of my life studying when markets fail, usually applied to environmental problems like climate change and biodiversity and clean air and water and so on. Obviously markets fail. But in studying the downside, I have come to appreciate the upside as well. what I have learned is that markets do fail, yes…but I also appreciate that they can work too. Our standard of living has increased significantly as societies learn that economics is not a zero-sum game. rather with free exchange based on self-interest regulated by competition can work to help improve our lives. the art is understanding/defining VALUE, the science is understanding/defining the EXCHANGE mechanisms that create or destroy value. this Nobel winners help us all better understand the EXCHANGE part of the equation. “the efficient market idea proposed by Fama, measured by Hansen, and criticized by Shiller.” that’s a good summary and the prize does make sense if viewed in that way.